A fifties' fashion staple, the sleek and seductive sheath dress has been around for centuries. 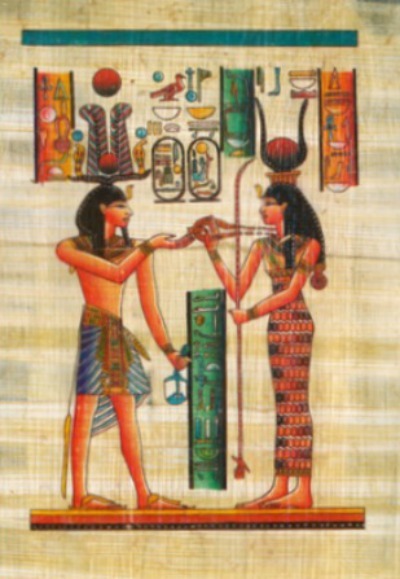 Artist renderings of the Goddess Isis depict her in an ancient Egyptian sheath dress woven of colorfully dyed linen and adorned with bead work and embroidery. An indication of her high social standing is the ankle skimming length of the skin tight dress. Looser variations are also seen in Roman togas and Grecian chitons. Modesty concerns as well as advances in textile weaving and distribution methods dictated full skirts and nipped waistlines for centuries and it would not be until the early twentieth century that styles trended toward a sleeker and more narrow form. 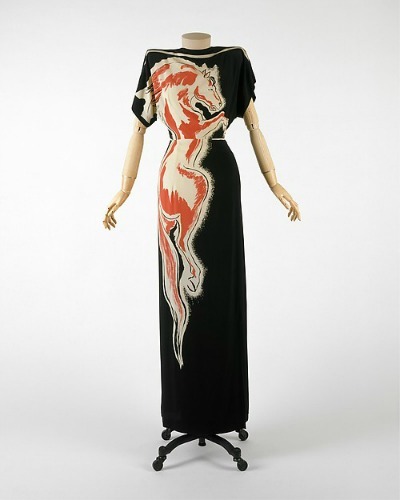 In the early 1900's French fashion designers Vionnet and Paul Poiret turned away from the S-shape corsets and hourglass styles to introduce a new silhouette featuring high waists and form fitting skirts. Women were no longer confined to a corset. Both designers cut fabrics on the bias to fit closely and effect a more graceful line. 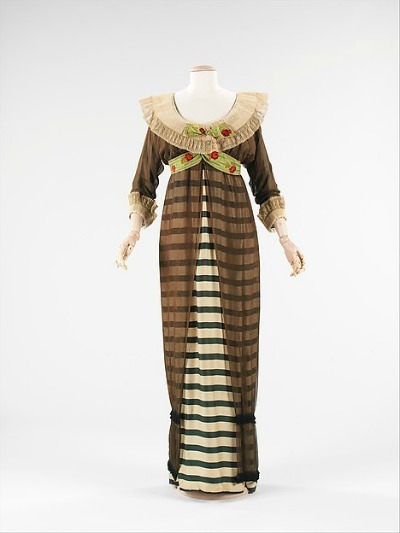 Poiret introduced the hobble skirt that heralded the soon to be popular pencil dresses. Spanish born Fortuny's innovative pleating of silk fabric into a tubular shaped sheath dress has become a very collectable vintage clothing item and popular favorite on the Red Carpet. Because of its close fitting and fluid design, his Delphos Gown is often referred to as a lingerie dress. Often credited with one of the first little black dresses, Coco Chanel's 1926 jersey knit design became her first clothing success and coincided with the popularity of the dropped waistline and vertically shaped flapper dresses. 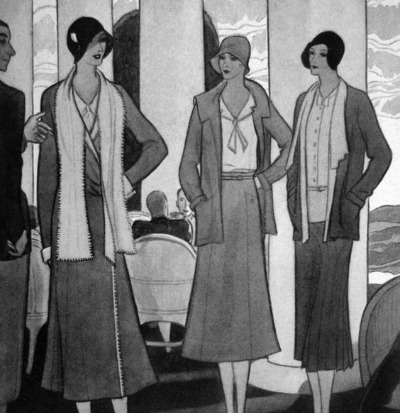 A softer, more feminine shape emerged in the latter part of the 1920's and into the early 1930's with the popularity of clinging fabrics and a long and lean line introduced by French designer Jean Patou. Slightly flared hemlines were worn mid-calf. Fabric rationing commenced during the late 1930's as Europe's attention was drawn toward the Second World War and excess fabric was needed for the war effort. To save on the meager fabric allocations, dresses were spare with slim skirts and knee length hemlines. Goods continued to be in short supply even after the war's end in 1945. Costume designer great Gilbert Adrian broadened the shoulders, added darts to waistlines, and narrowed the hip and thigh to fashion glamorous gowns with a comfortable cut and fit. Early forties fashion fatigue gave way in 1947 to Christian Dior's voluminous skirts, cinched waistlines, and mid-calf designs as the hourglass silhouette was once again in vogue. The bleak and unfeminine wartime look was replaced with the luxurious fabrics and styles women had yearned for since 1939. The woman's form continued to be celebrated as the most enduring of all 1950's style trends moved to the forefront in haute couture and ready to wear. Worn as both day and evening wear, the figure flattering sheath dress once again became and continued to remain a 1950's clothing staple. By design and definition, this versatile 1950's dress is simply cut, fits close to the body, and is lacking in embellishment. Synthetic fabrics allow the dress to fit snugly along the waist and hips. Darts from bust to waist and zippers either at the side or back are also common. It may be strapless, sleeveless, or long sleeved. Sheath dresses are also popular choices for bridal wear. Often considered interchangeable with little black dresses or a wiggle dress, the 1950's style is a classic design found in any color. It may have a straighter line than the slim pencil skirt. 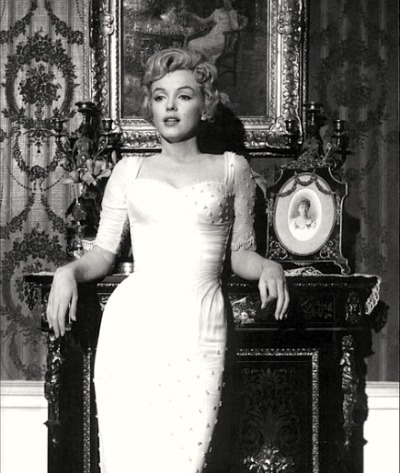 Although few look as spectacular as Marilyn Monroe did in the sheath dress costume worn for her role in The Prince and The Showgirl, the 50's dress is a becoming style for all figure types.